NOTE the chili peppers!!! One means a pretty easy Activity, two means a harder one, and three means a challenging Activity. It is up to you. 1. Read The Trojan War, Chapter 7: "Virgil's Aeneid: Roman Transformation of Homeric Myth." 2. Explore the links on the Virgil's Aeneid: From Troy to Rome page. 3. Read through all of the Activities on this list before making your selection. Some of the Activities are quite easy and may only require reading one text, while others are far more difficult, and may require reading more than one text or doing online research plus reading texts. Select Activities that interest you and are appropriate to the time you have to spend on them. You will not get a higher grade because you select a more difficult Activity. Some Activities that are especially complex will offer double credit; if so, that will be stated in the Activity question. If you select the double credit option, you must write "double credit" on your Activity AND you must develop your Activity in substantial depth, in order to qualify for the double credit. Follow the directions in your Blackboard course site to complete the activities. 1. In Book 1 of the Aeneid, Aeneas is presented as a new kind of hero, who wills to do what he has to do. Compare/contrast Aeneas in the Aeneid to Achilles in the Iliad, who does what he pleases and even gets the gods to cooperate at times. Do you have any ideas about why they are such different sorts of heroes? Use specific examples from both the Iliad and the Aeneid to support your ideas. 2. Compare Helen in the Iliad (Book 3) to Dido in the Aeneid (Book 4). Do you see any similarities? Differences? Explain and support your ideas using examples from both texts. 3. Being the child of a mixed union--god and human--can create problems. Compare the relationship of Achilles with his goddess mother Thetis in Book 1 of the Iliad to Aeneas' relationship with his goddess mother Venus in Book 1 of the Aeneid. Do you see any interesting similarities? Differences? Explain your ideas using supporting examples from both texts. 4. The Aeneid ends abruptly when Aeneas kills Turnus in Book 12. Why do you think Virgil ended his epic like this? What point was he making? Or do you think he would have changed the ending if he had lived to complete his revisions of the Aeneid? Develop your ideas using specific examples from the Aeneid to support them. 5. If Amazons intrigue you, look at Camilla in Book 11 of the Aeneid. You might want to also search for web sites about Amazons. Describe Camilla's appearance and behavior and how she dies. Why do you think Virgil included Amazons in his epic, especially considering the irrational behavior of the other female characters? Support your ideas with specific examples from the text. 6. Book 7 describes how furious Juno invokes the demonic Allecto to stir up war in Italy. Allecto infuses madness into the Queen, Lavinia's mother, and into Turnus, who had wanted to marry Lavinia. Despite the best attempts of human beings to avoid war, it becomes inevitable. Can you see any interesting parallels between the start of this war in Italy and the start of some twentieth century war which broke out despite the good intentions of many? Support your ideas with specific examples from the Aeneid and from the war you compare it to. 7. Fate is a crucial concept in the Aeneid. Look for a few places in the Aeneid where fate is mentioned and discuss each occurance, explaining what you think Virgil meant by "Fate" in the context of the story. Do you think his concept of fate is like yours or different? How? Be specific and support your ideas with examples from the Aeneid and from your own concept of fate. 8. 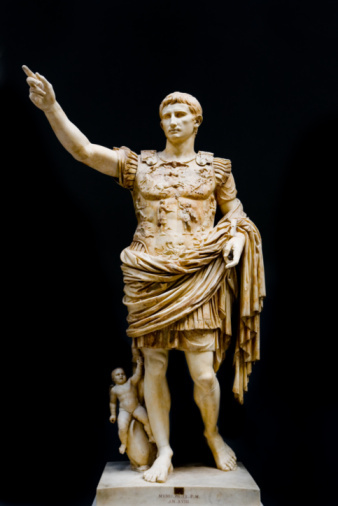 Search on the www for information about Augustus as well as images of him and his empire. Augustus was, in a sense, the real world hero of the Aeneid, as well as the ultimate patron for whom Virgil wrote. Read the information you find and look through the images. Then select a few images that seem to you especially relevant to the world of the Aeneid. Identify and describe each image and explain in specific detail how these images affect your understanding of Augustus and the Aeneid. 10. Irrational, "anti-fate" behavior in the Aeneid is mostly concentrated in the females, human and divine. Select several of these females to consider. List each one with a brief explanation of her irrational actions and attributes, identifying where exactly in the Aeneid these actions and attibutes occur. Do you think Virgil is saying something about women's behavior in general? What? Be specific and support your ideas with examples from the text. 11. Look at Jupiter in the Aeneid and compare him to Zeus in the Iliad. What similarities do you see? What differences? So what? Support your ideas with specific examples from both texts. 12. Turnus and Achilles. Look at the wild irrational and destructive behavior of Turnus in the Aeneid. He is a warrior out of control, wreaking havoc on his own people. Compare his destructive behavior to that of Achilles in the Iliad. Why do you think Achilles is a hero, while Turnus is something less? Explain your ideas using specific examples from both texts. 13. 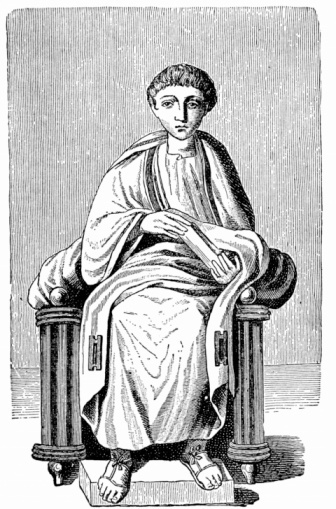 Aeneas developed a bad reputation among some medieval writers. Can you see any aspects of Aeneas in the Aeneid that might have led to such a degrading of his character? Do you think Virgil meant to include any negative traits? If so, what do you think they were? Be very specific, supporting your ideas with examples from the Aeneid. 14. Go to The Metamorphosis by Ovid. Scroll down the table of contents to find books 11, 12 and 13, which tell about the Trojan War. Read these three books and compare their version of the Trojan War with Virgil's narration of it in Books 1 and 2 of the Aeneid. NOTE: if your text of the Aeneid does not include all of Book 6, be sure to read the entire book following this link if you choose to answer this question. 16. Virgil's Aeneid and Exodus from the Hebrew Bible both tell about a somewhat reluctant, god-selected hero who leads his people out of disaster through many dangers and difficulties to the ultimate goal of a promised country (which must be fought for) and a great heritage. Compare the characters and experiences of Moses and Aeneas to see what they have in common and see if you can identify any profound ways in which they are different. This is a complex topic and you must use specific examples from both the Aeneid and Exodus to support your ideas. If you do this thoroughly, it can be worth double credit.